Inspired by his experiences with son Christopher Robin, author AA Milne creates the Winnie the Pooh stories. In the same vein as Finding Neverland, 2017’s Goodbye Christopher Robin looks at the story behind the creation of classic children’s literature. Set after World War I, author AA Milne (Domhnall Gleeson) remains haunted by his time in battle and struggles to create new work. Milne takes Daphne (Margot Robbie) and young son Christopher Robin (Will Tilston) to relocate to a remote location in the woods along with the child’s nanny Olive (Kelly Macdonald). Due to a variety of factors, Milne and his child wind up alone for a few weeks, and this experience gives birth to “Winnie the Pooh”, a success that creates unforeseen complications in the family. Given that I’m now 50, I guess I’ve known of Milne’s work for at least 45 years of my life. At no point over those decades can I claim I ever wondered much about the genesis of Pooh or his pals. 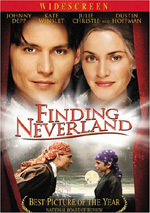 That leaves Goodbye as an “origin story” without pre-existing interest on my part, and I can’t claim my experience with Finding Neverland piqued my curiosity for a similar tale. While it enjoyed some good moments, most of Neverland seemed pretty sappy, and I fretted that Goodbye would follow a similarly melodramatic path. Alas, it does, so Goodbye lacks much real impact. It follows a baldly emotional path that never engages in a true way. In terms of story, Goodbye splits fairly evenly into two separate components. The movie’s first half looks at the creation of the Pooh series, while the second segment views the impact the books’ success has on the Milne family. Neither half works well, though I probably prefer the view of the post-fame Milnes. While I expected the basics of the “origin story”, the examination of how fame hit the Milnes came as more of a surprise, so that side allows for a fresher view. Unfortunately, Goodbye bites off way more than it can chew in a mere 107 minutes. Not only does it investigate the evolution of the Pooh books and then their success, but also it looks at Milne’s post-war trauma and familial issues. Any one of these topics could’ve sustained a film, so the inclusion of so many becomes an issue. Goodbye simply doesn’t enjoy enough cinematic real estate to explore any of its domains well. This leaves the plot points and the characters thin and without much real intrigue. Goodbye rushes through all the components and doesn’t allow enough time for any of them to develop in a satisfying manner. As such, the end result seems awfully superficial. Every once in a while, Goodbye shows a glimmer of promise, as it occasionally feels like it’ll find a niche to explore in a compelling way. But then the film quickly changes to something else and dashes hopes that it’ll offer substance. This leads to a film that feels cut down from a much longer effort, and the product can’t find its footing on a firm basis. The actors mostly seem competent, though the thin nature of the characters leaves them without much room to grow. Actually, given the one-dimensional nature of the tale, Milne and Daphne lack many warm overtones and usually come across as unlikable – until the movie inevitably tries to redeem them in a sentimental manner. If explored in a more complete – and less emotional - manner, Goodbye Christopher Robin might’ve turned into something reasonably compelling. As depicted here, the result seems choppy and incomplete. 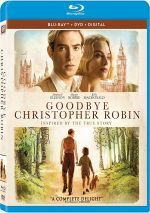 Goodbye Christopher Robin appears in an aspect ratio of approximately 1.85:1 on this Blu-ray Disc. The movie offered a fine transfer. Overall definition seemed positive. Virtually no softness materialized, sof the movie appeared accurate and concise. The colors tended toward teal tones, with some amber along for the ride as well. These appeared fine within the film’s stylistic choices. Blacks seemed dark and tight, and shadows demonstrated good clarity. This added up to a satisfying presentation. A character drama wouldn’t seem to be a candidate for a whiz-bang soundtrack, and the DTS-HD MA 5.1 audio of Goodbye fell into expected realms. A few scenes – mainly related to war flashbacks– used the various channels well. Usually the track remained oriented toward ambience, though, so don’t expect lots of sizzle from the mix. Audio quality satisfied. Although didn’t get much score, the music was full and rich, while effects showed nice clarity and accuracy. Speech – obviously an important factor here – appeared concise and crisp. Nothing here soared, but it all seemed perfectly adequate for the project. As we head to extras, we start with an audio commentary from director Simon Curtis and co-writer Frank Cottrell-Boyce. Both sit together for this running, screen-specific look at story/characters and the facts behind the film, cast and performances, sets and locations, period details and music. Though chatty, Curtis and Cottrell-Boyce don’t offer a ton of insights. Oh, they provide a passable overview of the production, but they often seem to just name actors or locations. This adds up to a lackluster commentary. Eight promotional featurettes appear. We find “A Walk In the Woods” (2:34), “Healing a Nation” (2:11), “AA Milne” (2:01), “Hello Billy Moon” (2:32), “Daphne Milne” (2:17), “The Story” (2:24), “Christopher Robin and His Nanny Olive” (3:18) and “The Cast” (2:32). Across these, we hear from Curtis, Cottrell-Boyce, biographer Ann Thwaite, production designer David Roger, location manager Camilla Stephenson, producer Damian Jones, and actors Will Tilston, Margot Robbie, Kelly Macdonald, Alex Lawther, Stephen Campbell Moore, and Domhnall Gleeson. The featurettes look at locations and aspects of the source material as well as cast and performances. As expected, the featurettes act to sell the movie. A few minor tidbits emerge along the way, but don’t expect much substance from them. A Gallery presents 25 stills. A mix of movie shots and images from the set, it creates a mediocre compilation. The disc opens with ads for Gifted, Hidden Figures and Step. We also get a trailer for Goodbye. A second disc provides a DVD copy of Goodbye. It includes the same extras as the Blu-ray. As an exploration of the genesis of Winnie the Pooh and the life of its creator, Goodbye Christopher Robin lacks substance. It tries to pack in too many elements, so none of them satisfy. The Blu-ray boasts excellent picture along with acceptable audio and a few supplements. Goodbye delivers a superficial, sentimental effort.